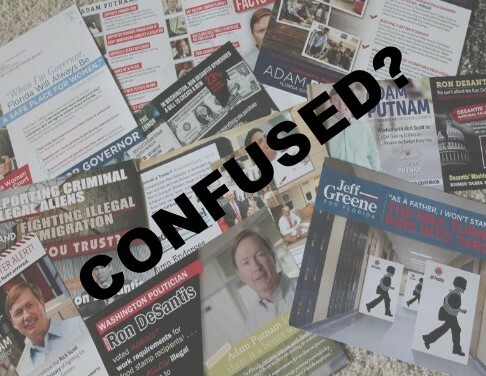 BAY POST INTERNET: 2018 Primary Election – Are you confused? Putnam was my guy for Governor, but DeSantis has put on quite a run, I am struggling with my decision. Author: So You Want to Blog. You might think that since I write a lot about politics, I would have this primary election thing all figured out and be ready with a handful of recommendations on who you should vote for. Since I am a registered Republican, and my wife is a registered Democrat, we get all of mailers, door hangers and robocalls. I have dutifully sorted through them, and I find little compelling information. The debates are proving useless as it now seems the in-vogue thing is not to answer a debate question no matter what it is. I wish one of the debate moderators would ask a candidate for Governor what his/her name is, so we could maybe get one straight answer. Watching a bunch of billionaires and millionaires slug it out in a so-called debate is entertaining but not particularly informative unless you consider the fact that no matter how much money these guy’s have very little of what they promise can actually be delivered. I wish there was another woman running for governor. I am really over Gwen Graham playing the “mom” card. In the Senate race, I am all in on Rick Scott, you will note in my disclosures, I am a contributor to his campaign. Putnam was my guy for Governor, but DeSantis has put on quite a run, and since I am a Trump supporter, I am struggling with my decision. There is something nice about having a governor who has more than enough money already, so he will not be easily influenced. It is also a concern of mine that if DeSantis wins the Governor’s office, he will immediately be on Trump’s short list for Vice President in 2020 since I firmly believe VP Mike Pence has had enough. It would be much easier for DeSantis to roll with Trump. We might have Ron for a little over two years before he moves on, so his lieutenant Governor becomes a key decision. In the long run, Florida might just be better off with Adam Putnam. Calm, cool headed, there won’t be a lot of fireworks from Tallahassee, but my bet is a lot of good things will get done. Adam will not be on Trump’s VP short list, so he can focus on all things Florida. On the Democratic side, my wife is not a big fan of Jeff Green, thinks he looks a bit shifty as he talks out of the side of his mouth. She is also over the Gwen Graham “mom” thing but maybe not enough to vote for someone else. She seems to perk up when a Phillip Levine ad runs. As to the local races, this election cycle has been a blizzard of mailers, TV ads and pseudo debates it is very hard to sort out who is the best candidate. County Commission, City Councils, School Board in all these races I would take the Tampa Bay Times recommendations with a grain of salt. Look for honesty and integrity. I always have the biggest problem with the Judge candidates. We hardly know these people; the incumbent has a significant advantage so who do you vote for? The Tampa Bay Times has long been a good source of information on the Judge races, although with the changes at the Times and its growing self-serving nature, you may want to do some research on your own. It boils down to this. If you like leaders who are wealthy you have some to choose from. If you like normal, people who want to serve their community you have a few to choose from, and if you want professional politicians who like the lime light, the backslapping, the free meals and really don’t worry that much about what you think or what you need your choices are endless. I am getting ready to fill out my mail in ballot, and if yours is still laying around somewhere in the house, now would be a good time to go get it and start making some decisions. 1R, 1D. A mixed marriage it is. Any guns in the house? My first wife and I were in same situation. We decided one day to skip voting for one election because we would just cancel each other out. Then I heard her car start - she said she was going shopping. A neighbor saw her at the polling place. AHA!! !